Charging an electric vehicle is a key part of owning and operating one. Here’s what you need to know about charging in Maine. Sales of electric vehicles (EVs) have tripled nationally in the past five years, with more than 500,000 EVs on the road in the US, and all indicators point to considerable growth into the future. As battery range increases and the price of electric cars continues to drop, consumer interest in EVs is growing. While most charging happens at home, there are plenty of benefits to charging your car while at work or running errands. Public charging and workplace charging stations can extend the daily range of electric vehicles and reduce the amount of gasoline consumed by plug-in hybrid electric vehicles. As electric vehicles become more popular, municipalities, state agencies and local businesses have become increasingly interested in offering charging to their customers and employees. 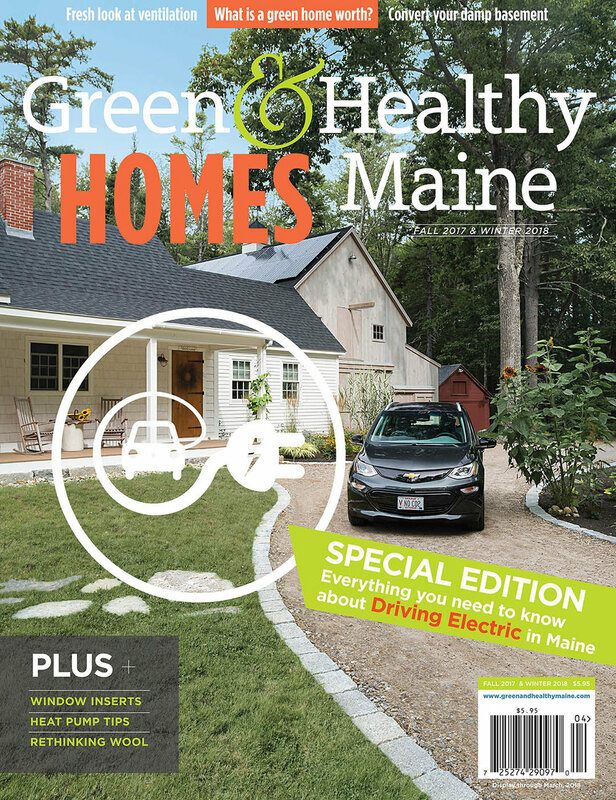 In August 2012, there were only five public charging stations for electric vehicles in Maine. Today, there are more than 100 public charging stations around the state, and their numbers continue to grow. While most stations are concentrated in southern Maine where the population density and EV ownership is highest, there are public charging stations as far east as Calais and as far north as Millinocket. Most of these charging stations can accommodate various vehicle brands and charging standards. Electric vehicle charging stations fall within three basic categories of charging speed: Level 1, Level 2, and Direct Current (DC) fast chargers (sometimes called “Level 3”). Most electric vehicles come with a portable Level 1 cord set, which can plug into a standard 3-prong, 120V household outlet, though dedicated Level 1 chargers can also be wallmounted. These are often referred to as “trickle-chargers” because they are the slowest—providing about 5 miles of range for every hour charging—and usually require an overnight charge to fully replenish an EV battery. Level 2 chargers are the most common and offer charging through a 240V or 208V plug similar to the electrical hookup required for an electric clothes dryer. They charge twice as fast as Level 1 chargers, at a rate of 10 to 24 miles of range/ hour. A Level 2 charger, suitable for home charging, can be purchased for $500-$600 or less plus the cost of installation. In addition to homes, Level 2 public charging stations are typically located in places with a higher concentration of people and locations where cars are parked for long periods of time, such as workplaces, shopping centers, city parking lots and garages, airports, hotels, government offices and other businesses. DC fast chargers are the most powerful and can add about 60 to 100 miles of range to an EV’s battery in 20 minutes or less. Fast chargers are commonly located along highways and are utilized for long distance travel. They can also be located at shopping centers, such as the five installed at Hannaford stores in Maine. There are currently 13 DC fast charging stations in Maine, with more in the works. In the near future, as charging technology advances, these chargers are expected to charge an EV battery in the same time it takes to fill a tank of gas in a conventional vehicle. Some public charging stations in Maine are part of larger “charging networks” that exist around the country. Charging networks consist of individual charging stations owned and/or maintained by a single company (examples include ChargePoint, EVgo and Tesla). Each network has a unique payment model, with the most common approaches being monthly subscriptions, pay-as-you-go (i.e., pay per charge) and free (free to charge and no subscription fee required). More than half of all public stations in Maine offer charging at no cost to the user. Electric vehicle owners can now use two major online and mobile apps to find public charging stations in Maine. The most common is Plugshare, www.plugshare.com, whose data is crowd-sourced by a large community of EV owners. Users can provide feedback on their charging experiences and plan for charging on trips through the website and smartphone app. Another popular source of information about charging stations is the AFDC Station Locator, a comprehensive database of alternative fuel stations in all 50 states, which are independently verified by the US Department of Energy. Many charging networks have their own mobile apps for locating their charging stations (such as ChargePoint), which show real-time availability of individual charging stations on their network. And most EVs also have simple on-board charging station locators built into their navigation systems that will alert you to nearby charging options if the vehicle’s battery is getting low. New public and private funding opportunities are helping to accelerate the deployment of charging stations around Maine. Eighteen new Level 2 EV charging stations are now available in southern and central Maine thanks to a $50,000 Avangrid Foundation grant awarded to Maine Clean Communities, a program of the Greater Portland Council of Governments (GPCOG). The charger locations include town halls, city parking garages, a hotel, universities, schools and the Maine State House parking garage. Several Maine-based companies including IDEXX, Revision Energy, Hannaford and Unum have joined the national Workplace Charging Challenge initiative, providing EV chargers and designated parking spots as a benefit for their employees. Evidence shows that employees are six times more likely to purchase an EV if they have access to charging at work. Local initiatives are also springing up. 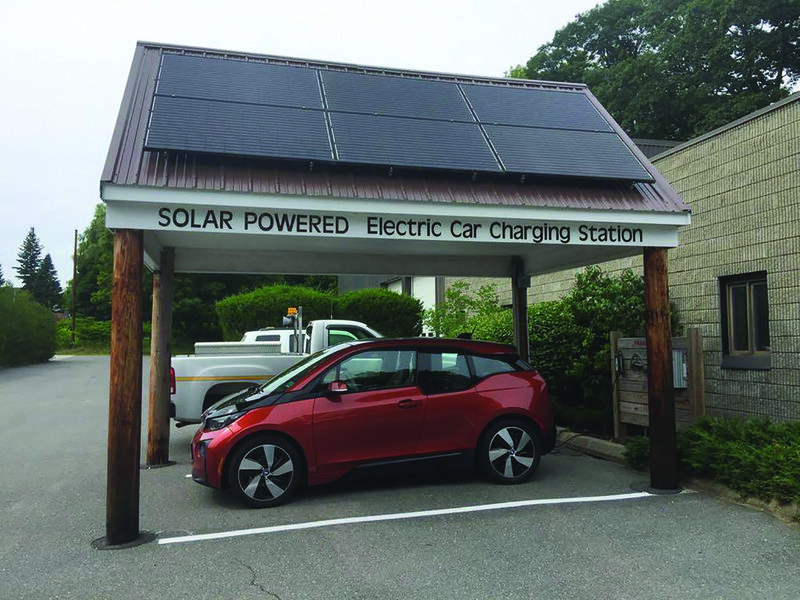 Through a collaboration of area businesses and organizations in Oxford Hills, a solar-powered charging station was recently installed in the parking lot of Oxford Hills High School along Route 26 in Paris. Charging is open to the public and free of charge. The station is visible from Route 26, a busy corridor through western Maine for tourists, skiers and residents, and is the state’s first solar array that tracks the sun to charge electric vehicles. EV charging infrastructure initiatives aren’t limited to local and state efforts, either. Last year the U.S. Department of Transportation designated 48 electric vehicle charging corridors along 25,000 miles of major U.S. highways—including I-95 in Maine—as a way to make it easier for drivers to switch to electric vehicles. The plan calls for electric vehicle charging stations to be installed at least every 50 miles within the corridors and new government-approved signage to help drivers identify the locations of charging stations along the highway in 35 states. The increasing range of electric vehicles, faster charging and more robust public charging networks are contributing to the accelerating deployment of electric vehicles in Maine and around the country. Keep your eyes open for these vehicles and chargers, because you’ll start seeing them in more and more places around the state.